CA: Falvey Memorial Library’s bracketed author tournament advances into the Sweet Sixteen round this week. To talk about the match-ups, we’ve invited guest analyst and Outreach Librarian Darren Poley, who will also make his predictions for the round of eight. Stay tuned here for future tournament updates, including more re-caps, and even news about a prize giveaway during the Final Four. As always, be sure to check out the poster on the first floor near the circulation desk to vote in these exciting match-ups. Take it away, Darren! DP: Book-atology voting is shaping up nicely at Falvey, but there have been some upsets. In the East, Hemingway and Melville made it to the sweet sixteen over Conrad and Dostoyevsky respectively. Joyce rolled on without a hitch. But the real story is Rowling squeaking by Poe, when Poe had such a strong start over Flannery O’Connor in the first round. Who from the East do I think will make it into the elite eight? Because Melville is polarizing, I think Rowling will prevail, and Hemingway will muscle his way past Joyce. The powerhouses will dominate the darlings of the literati, just like they did in the first round when Milton, Thoreau, and Charlotte Bronte went down. The South is a different story where the edgier writers (Shelley, Salinger, Kafka, and Woolf) were beaten handily. I see real fights brewing in the matchups of Austen vs. Twain and Fitzgerald vs. Dickens. I think media exposure like the Lizzie Bennett Diaries and the Gatsby film deal will help, and even though Austen was seeded second and Fitzgerald fourth, I think the dynasties of Dickens and Twain will be too hard to beat in the end. I predict however it is going to be close, in fact perhaps too close to call beforehand, especially for Austen who is amazingly resilient. After Dr. Seuss’ phenomenal display in the early rounds, in the Midwest; I predict Orwell will not make it to the elite eight. The other head-to-head in the sweet sixteen of Oscar Wilde vs. the Bard will be the biggest battle of the season. In the end I think because of Shakespeare’s dominance in the game and because folks love the way he keeps things ‘old school’ means Wilde is going down. This would have Shakespeare vs. Seuss going toe-to-toe in a matchup made in college vs. nursery heaven. I see the seeding still holding true in the West. Tolkien seed number one will take out the upstart, Bradbury. C.S. Lewis the number three seed will defeat Christie even though she will give him a run for his money. The win of Tolkien over Dante and Bradbury over Faulkner in the last round however created quite a stir. Fantasy & sci-fi trounced pathos. 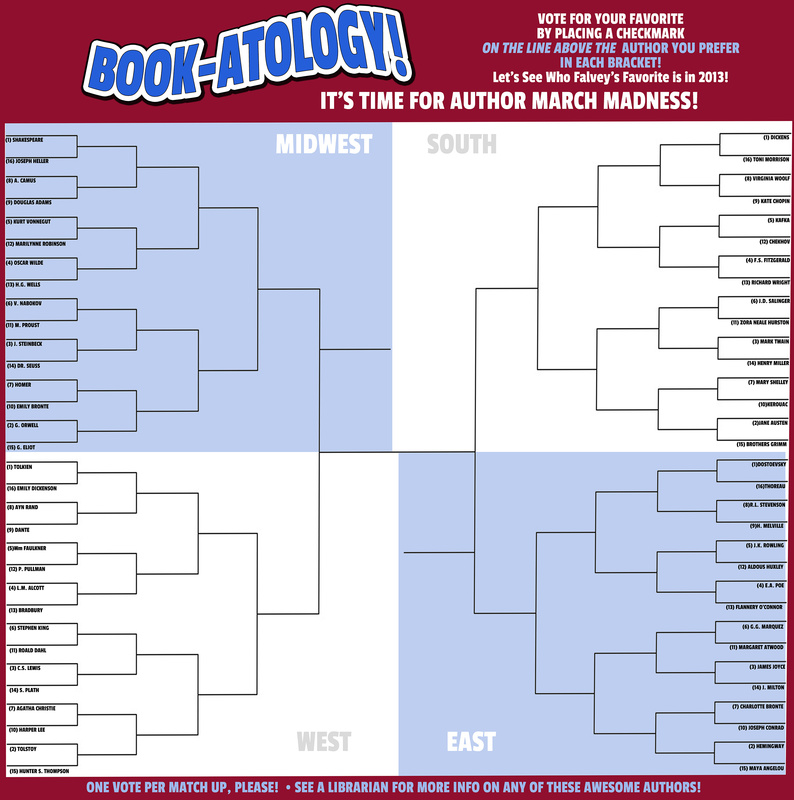 I see Fantasy crushing sci-fi and mystery in the elite eight. Overall I see the elite eight being the elegant eight with the classics dominating, except for the now popular Rowling and Seuss continuing to be the newcomers to watch due to their appeal. Newcomer? He wrote And to Think That I Saw It on Mulberry Street in 1937! Also, who hasn’t read The Cat in the Hat? To top it off, his birthday is Read Across America Day!